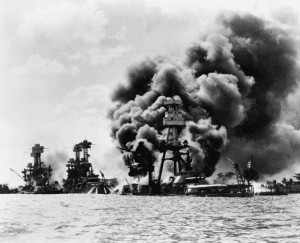 On the 70th anniversary of President Franklin D. Roosevelt’s famed “Day of Infamy” speech before a join session of Congress, asking for a declaration of war, catapulting America into World War II, perhaps it’s appropriate to pause and remember the 2,400 armed services members who had died a day before in the Empire of Japan’s attack on Pearl Harbor, Hawaii. Our Pacific Fleet was still burning — eight battleships sunk or damaged. We had one combat-ready unit of the U.S. Army. The Nazis had 200, the Japanese 100. There was fear that Japan would hit the West Coast next — and we would be powerless to do anything about it. We entered the war — and won, thanks to the sacrifice of tens of thousands of members of the U.S. Army, Navy, Coast Guard and Marines. Here the University of West Virginia’s marching band pays them tribute.